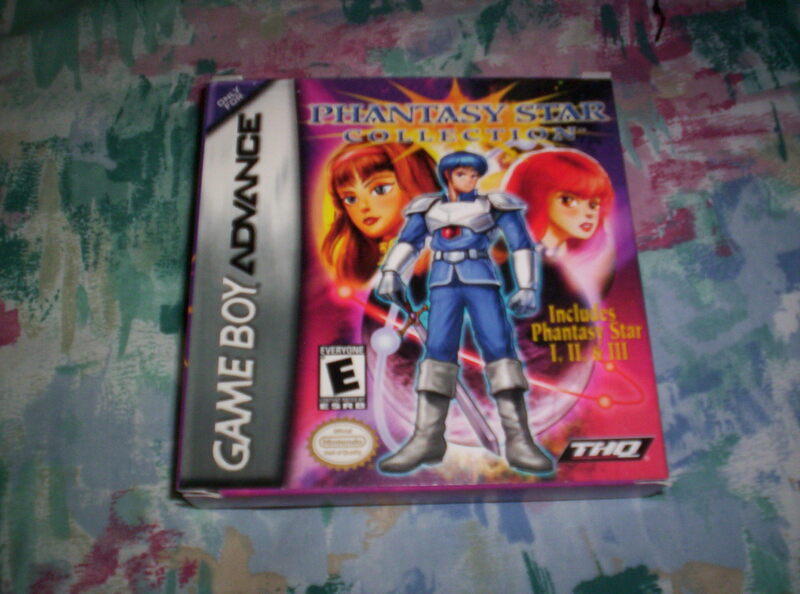 Phantasy Star Collection is a compilation of Sega’s Phantasy Star games for the Game Boy Advance. This collection has Phantasy Star 1, 2, and 3. The first Phantasy Star game was originally released on the Sega Master System while the second and third games were released for the Sega Genesis. When I first heard about this Phantasy Star Collection for the GBA, I was really hoping that Phantasy Star IV, a great installment of the series for the Genesis, would be included as well, so when I found out that it wasn’t, naturally I was a bit disappointed. Phantasy Star IV is one of my favorite 16-bit RPGs of all time. I’m not sure why Phantasy Star IV was left off this collection, but if the reason is because there wasn’t enough space on one GBA cart for all four Phantasy Star games, then that’s understandable. If that’s the case I would have loved for them to release a port of just Phantasy Star IV on one GBA cart, just like what Capcom did with Breath of Fire. I would have bought this game in a heartbeat. Later on Sega did include Phantasy Star IV on the Sega Genesis Collection for the PSP, which was super cool of them to do, so if I wanted to play this game on a handheld system, I just played it on my PSP. Anyway, when I bought my copy of Phantasy Star Collection for the GBA I had not played the three Phantasy Star games in this collection. I have played and beaten Phantasy Star IV multiple times on my Sega Genesis, but I never played the first three Phantasy Star games. Out of the three games on this collection, I ended up playing Phantasy Star II the most. I actually made all the way to the final boss but I could not beat it despite trying several times. I couldn’t get into Phantasy Star I because the first person dungeon perspective, which I knew this game had prior to playing it. I also couldn’t get into Phantasy Star III very much because I couldn’t get into the story. This entry was posted in Nintendo, Videogames and tagged Game Boy Advance, Game Boy Advance Games, GameBoyAdvance, GBA, GBA Games, GBA RPG, GBA RPGs, My GBA Games, Nintendo, Nintendo Game Boy Advance, Nintendo Games, Nintendo GBA, Phantasy Star, Phantasy Star Collection, Phantasy Star Collection Game Boy Advance, Phantasy Star Collection GameBoyAdvance, Phantasy Star Collection GBA, Phantasy Star Game Boy Advance, Phantasy Star GameBoyAdvance, Phantasy Star GBA, Phantasy Star I, phantasy Star I GBA, Phantasy Star II, Phantasy Star II GBA, Phantasy Star III, Phantasy Star III GBA, Sega, video game, Video Games, Videogame, Videogames. Bookmark the permalink.